The New York City Sheriff's Office was founded in 1626. 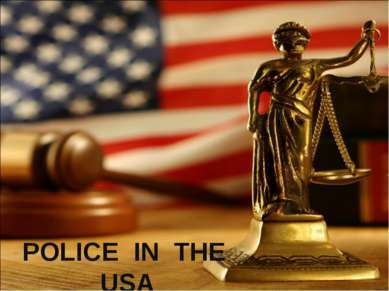 The first local police department was the Boston Police Department in 1838. The New York City Police Department was founded in 1845. 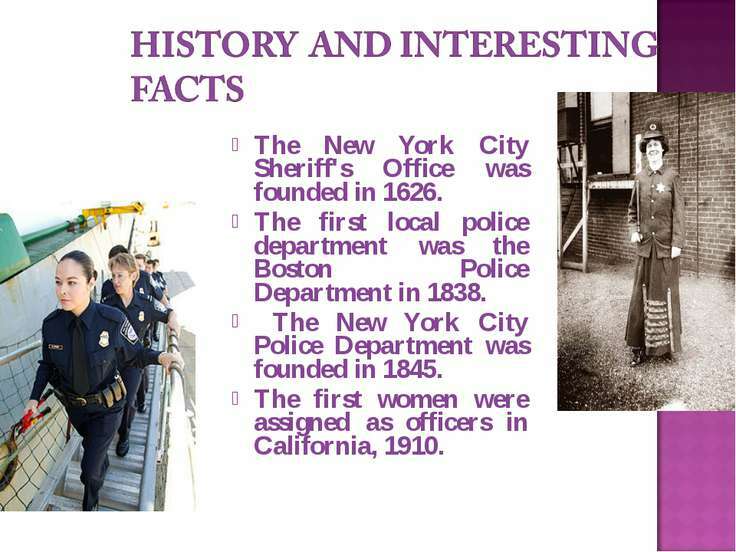 The first women were assigned as officers in California, 1910. 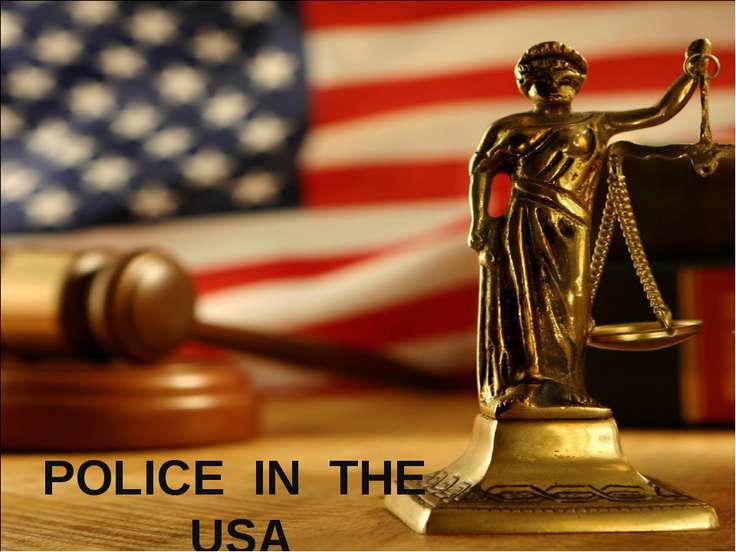 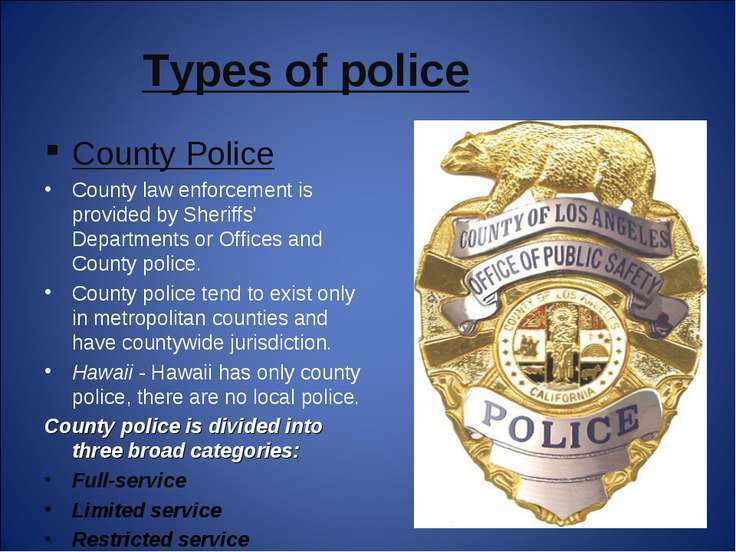 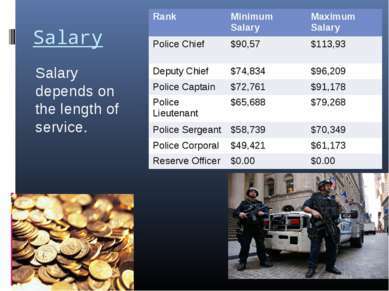 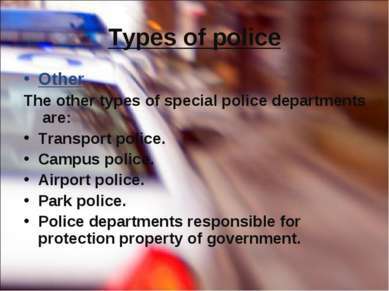 Types of police Policing in the US is conducted by numerous agencies at many different levels. 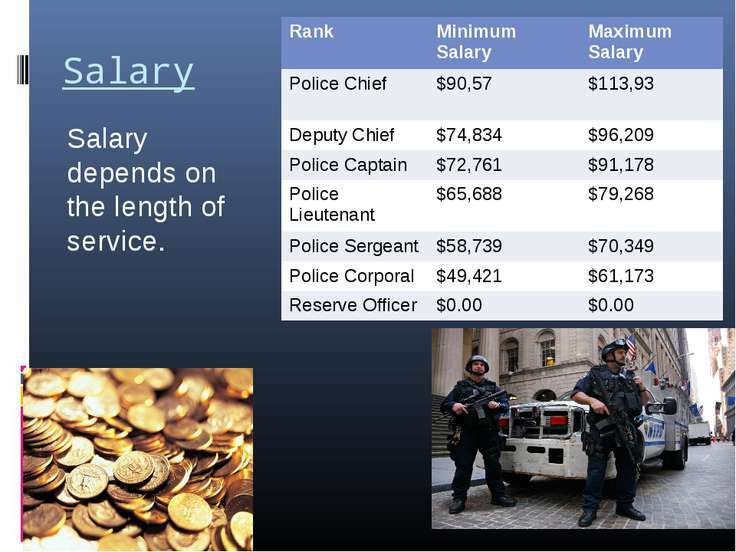 Their duties varies from state to state. 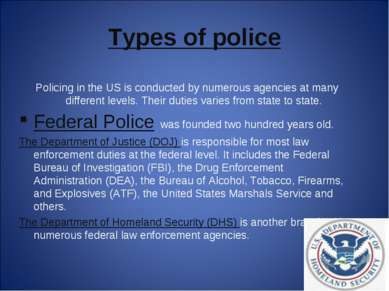 Federal Police was founded two hundred years old. The Department of Justice (DOJ) is responsible for most law enforcement duties at the federal level. It includes the Federal Bureau of Investigation (FBI), the Drug Enforcement Administration (DEA), the Bureau of Alcohol, Tobacco, Firearms, and Explosives (ATF), the United States Marshals Service and others. 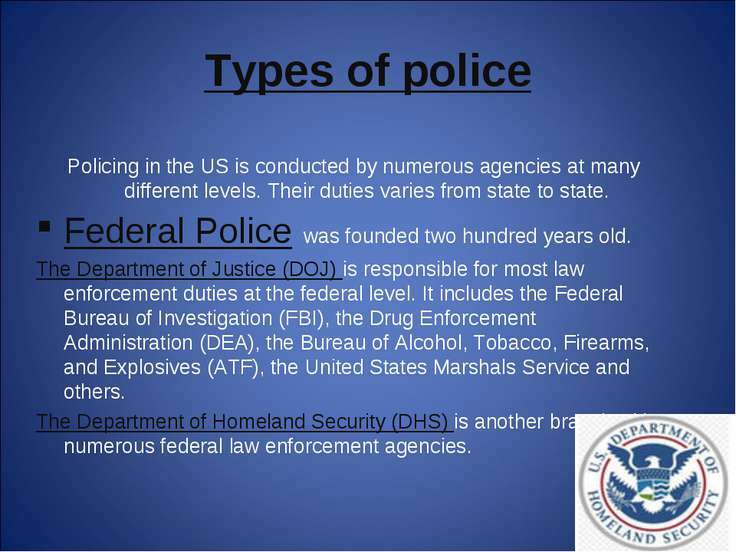 The Department of Homeland Security (DHS) is another branch with numerous federal law enforcement agencies. Types of police State Police States police agencies provide law enforcement duties, including investigations and state patrols. 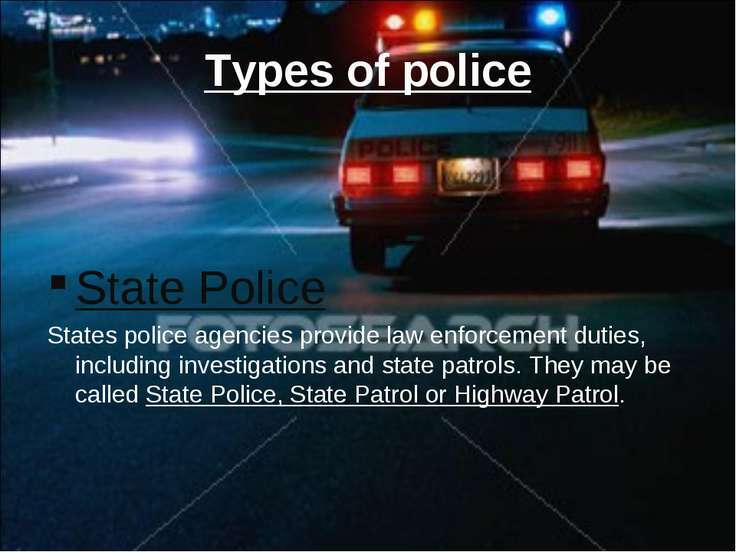 They may be called State Police, State Patrol or Highway Patrol. 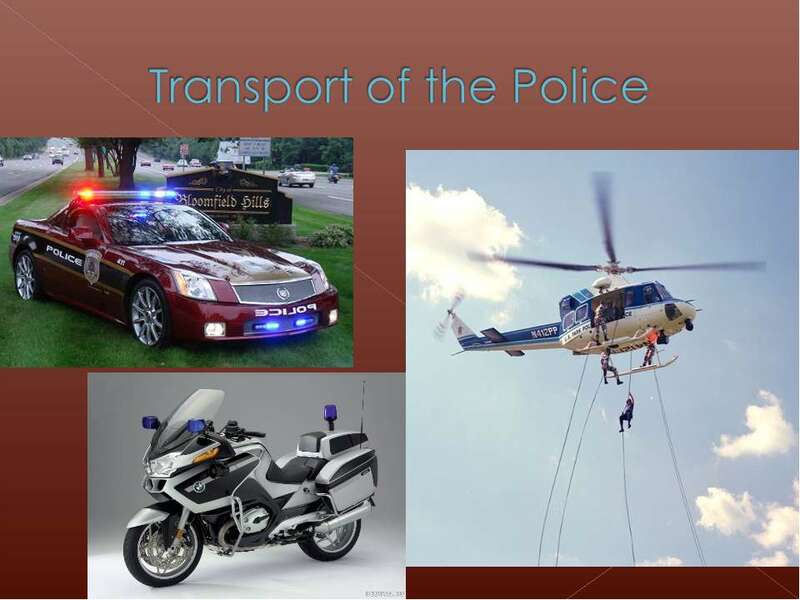 Types of police Other The other types of special police departments are: Transport police. 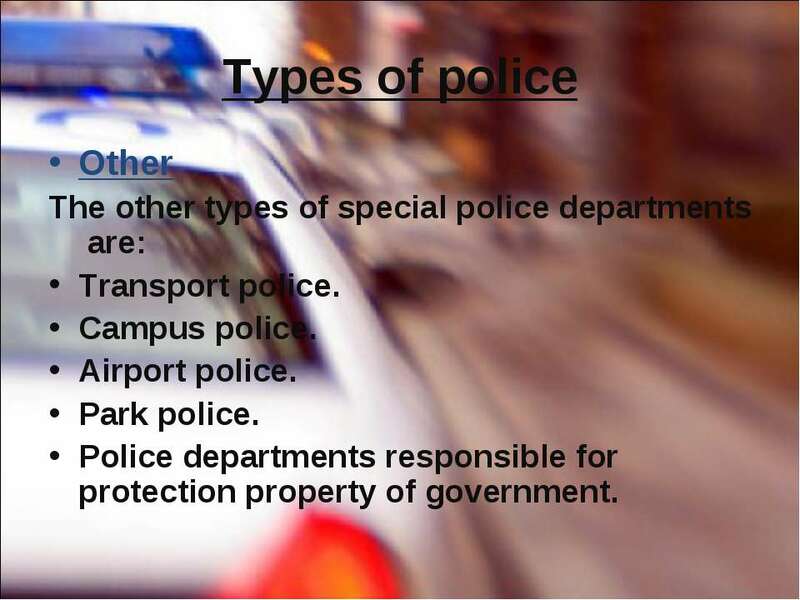 Campus police. Airport police. Park police. 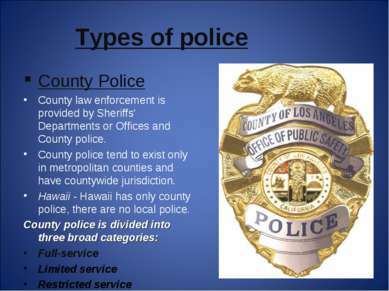 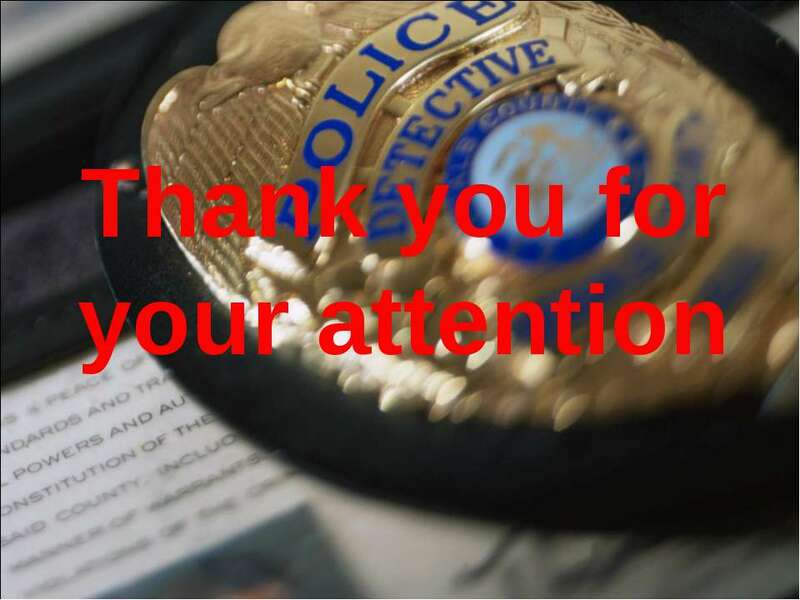 Police departments responsible for protection property of government. Police functions Peace and order maintenance. Law enforcement. Crime Prevention. Crime Detection. 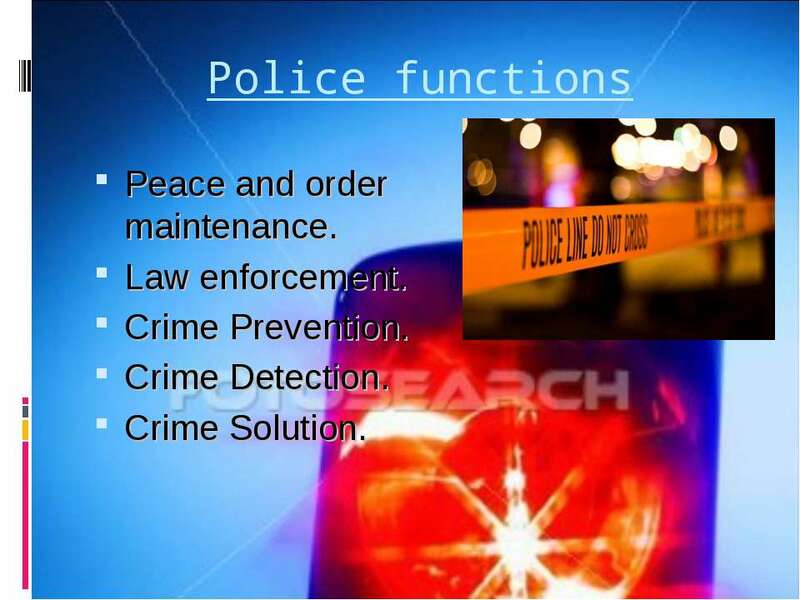 Crime Solution. 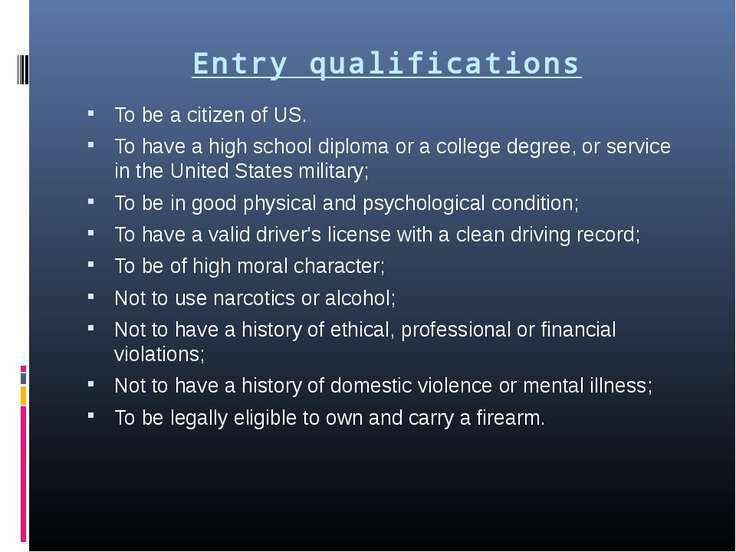 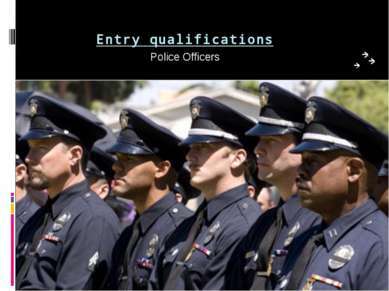 Entry qualifications To be a citizen of US. 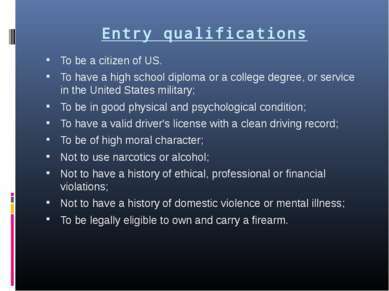 To have a high school diploma or a college degree, or service in the United States military; To be in good physical and psychological condition; To have a valid driver's license with a clean driving record; To be of high moral character; Not to use narcotics or alcohol; Not to have a history of ethical, professional or financial violations; Not to have a history of domestic violence or mental illness; To be legally eligible to own and carry a firearm. Handguns Police in the United States usually carry a handgun on duty. Many are required to be armed on-duty and off-duty. 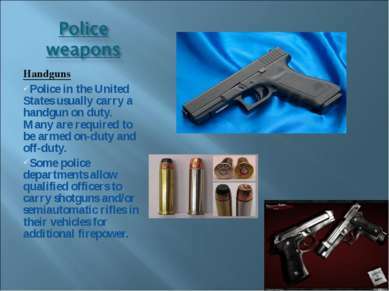 Some police departments allow qualified officers to carry shotguns and/or semiautomatic rifles in their vehicles for additional firepower. 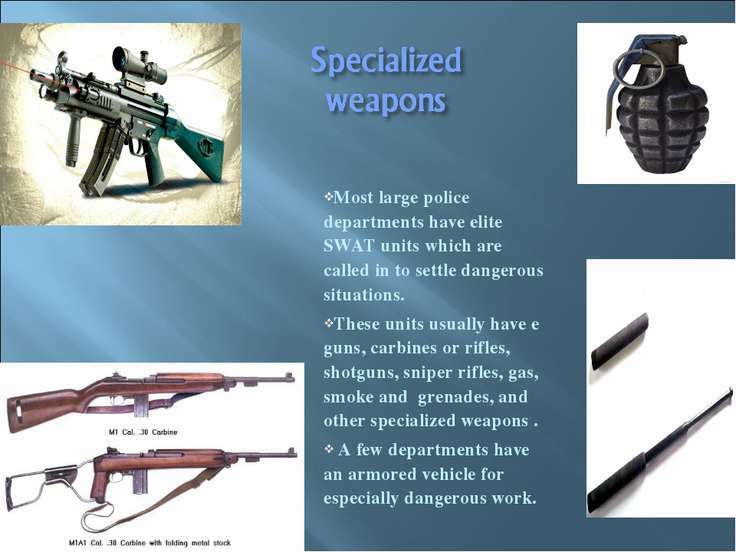 Most large police departments have elite SWAT units which are called in to settle dangerous situations. These units usually have e guns, carbines or rifles, shotguns, sniper rifles, gas, smoke and grenades, and other specialized weapons . A few departments have an armored vehicle for especially dangerous work. Most American police departments are dispatched from a centralized communications center. 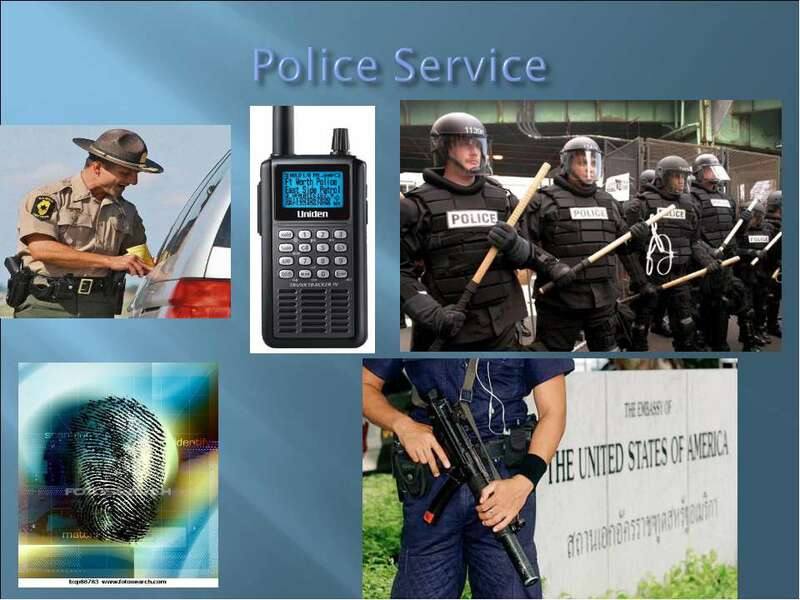 American police cars are equipped with portable computers linked by radio to a network allowing them access to state department of motor vehicles information, criminal records, and other important information. The number "911" is the universal emergency number for everyone in the United States. 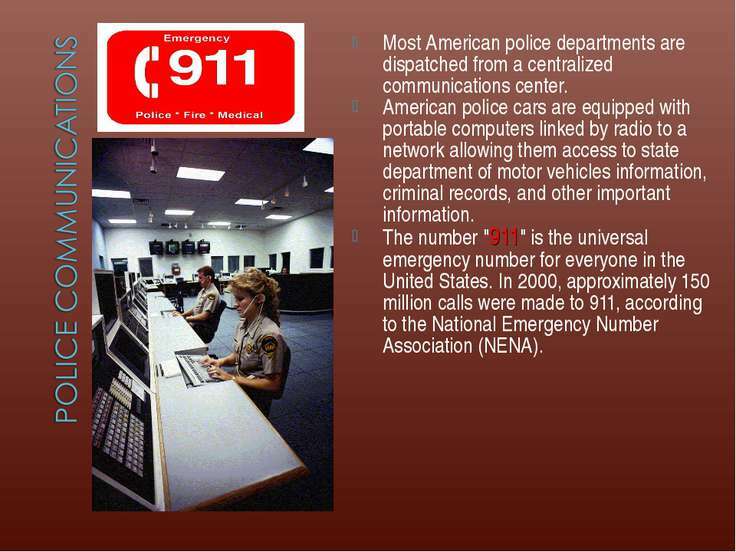 In 2000, approximately 150 million calls were made to 911, according to the National Emergency Number Association (NENA). 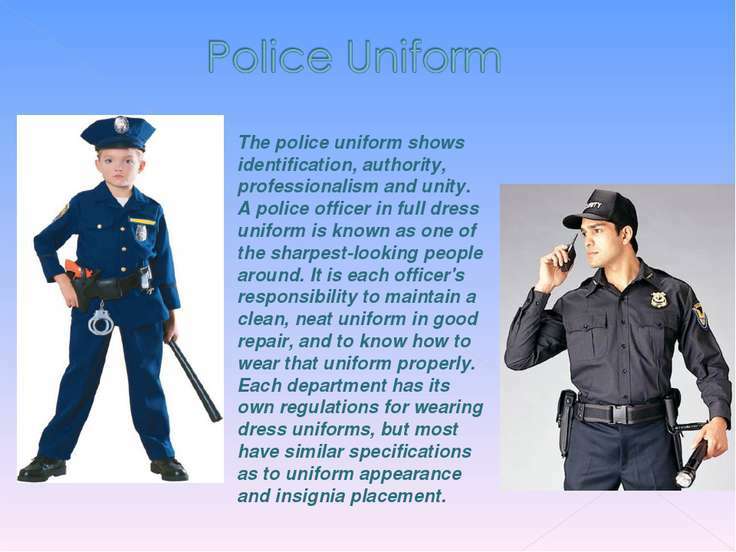 The police uniform shows identification, authority, professionalism and unity. A police officer in full dress uniform is known as one of the sharpest-looking people around. It is each officer's responsibility to maintain a clean, neat uniform in good repair, and to know how to wear that uniform properly. 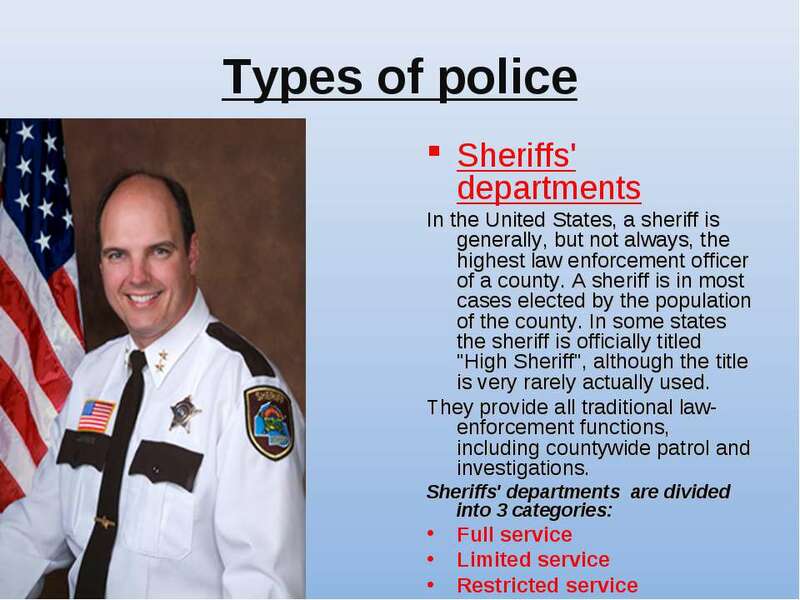 Each department has its own regulations for wearing dress uniforms, but most have similar specifications as to uniform appearance and insignia placement.